It’s been quite a month for Gabi! Having been selected to represent Pentathlon GB during qualifying events in the summer, Gabi’s first ‘cap’ came at the World Biathle Championships held in Viveiro, Spain 21-24th September. Biathle is a combined open water swimming and running event, and first up was the mixed relay. A very hard fought race saw Gabi just missing out on a podium finish when her and her partner Zach finished in a very well earned 4th place! 4th is always hard, but with hope and determination for the individual event, Gabi and the team spent the next two days putting in some training on the fabulous beaches of Northern Spain. It might just have paid off, as in the individual event Gabi, who competes in the Under 13 age group category (but who was only 10 years old at the time), performed brilliantly finishing 8th in the individual competition. As the 2nd GB girl to cross the line, it was an excellent contribution to the U13 girls’ team overall position and they picked up the WORLD U13 TEAM SILVER MEDAL! No sooner was Gabi back from Spain, she was in preparation for the British Modern Triathlon Championships held in Solihull at the end of September. This event also comes under the Modern Pentathlon umbrella, and is a combination of swimming, shooting and running (there are no bikes in Modern Pentathlon!). 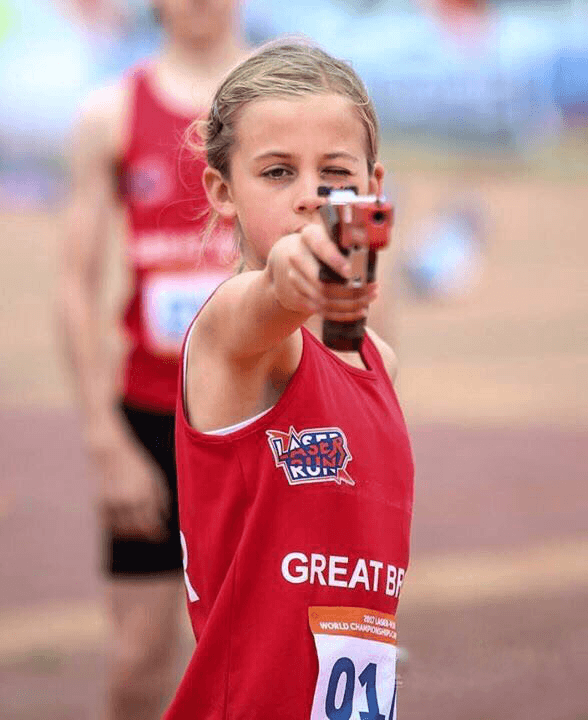 With a near personal best in the pool, followed by a brilliant shoot and run, we saw Gabi finishing with a fantastic tally of 644 points – enough to crown her British U13 Girls’ Champion for 2017! British Laser Run World Champion! Crossing the line first, Gabi claimed GOLD in the Under 13 girls’ event! World U13 Girls’ Laser Run Champion has a nice ring to it! A strong field of competitors saw Egyptian and South African athletes finishing in Silver and Bronze positions respectively. Delighted with a gold in the bag, but with no time to celebrate yet, Gabi had to refocus once more. A second day of racing in the mixed relay, saw Gabi and her brilliant partner Oliver work hard for each other. 2 laps from Gabi and then 2 from Oliver saw them just pipped-to-the-post by a sharp-shooting Egyptian pair. They fought all the way, but had to settle for 2nd place (just 2 seconds behind), picking up a fantastic Silver medal!! A short rest for Gabi now ahead of the British Biathlon Championships at the end of November, and some winter training ahead of Tetrathlon (swimming, fencing, running and shooting) and full Pentathlon events (which also includes show jumping) early next year. We look forward to many more chapters in this adventure … Gabi has reliably informed us she’s “not done yet” and is already looking forward to defending her titles in 2018! Anyone willing to bet against her??! !